Elaine Ashley and Michele Smith participated in 2018 Susan G. Koman 3-Day Walk in Atlanta in October. This is their 10th annual participation in walks to raise awareness in the fight against breast cancer and their first 60-mile walk. The Susan G. Koman 3-day events took place in six cities in the U.S. in 2018. 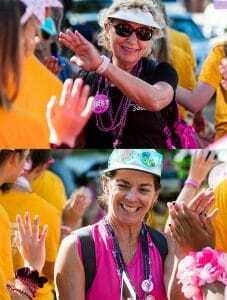 Between 2009 and 2017, Michele and Elaine walked for the Avon Walk for Breast Cancer, an almost 40 mile walk over 2 days. They have walked in Charlotte (2009, 2010 and 2012), New York City (2011), Santa Barbara (2013), Chicago (2014), Boston (2015), Washington, DC (2016), and San Francisco (2017). Michele, a two-time cancer survivor, and Elaine have raised tens of thousands of dollars in their efforts in the fight against cancer over the last decade.